Aesop is a retail skincare store that specialises in boutique botanical products located in Adelaide. 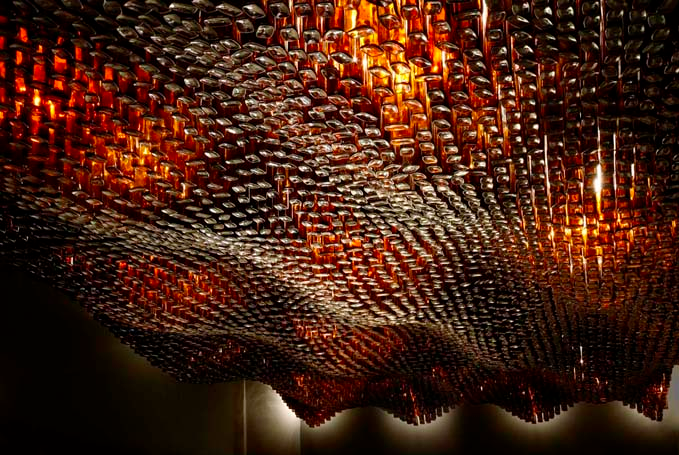 It’s glass bottle ceiling is crafted entirely out of recycled glass bottles arranged in a funky wave pattern. Thousands of recycled amber glass bottles glitter the ceiling making for a impressive focal point in an otherwise moderate interior. Aesop is known for placing the attention on its product packaging in precisely arranged rows. Voodoo Glass have extensive expertise in architectural glass applications. Contact us today to discuss your next project with us.